Trump's lawyer suggests sanctions on Iran could lead to "successful revolution". State Department: He does not speak for the administration. 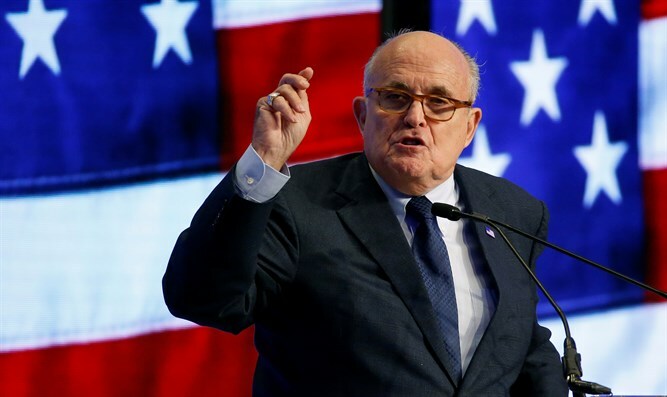 US President Donald Trump's personal lawyer, Rudy Giuliani, on Saturday asserted that US sanctions on Iran are leading to economic pain that could lead to a "successful revolution," Reuters reported. His comments, however, contrast with administration comments that government change in Tehran is not US policy. "I don't know when we're going to overthrow them," said Giuliani, who spoke in his own capacity at an Iran Uprising Summit held by the Organization of Iranian-American Communities, which opposes Tehran's government. "It could be in a few days, months, a couple of years. But it's going to happen," Giuliani was quoted as having told a crowd at a hotel in Times Square. In July, the former New York mayor said that Trump will suffocate Iran’s “dictatorial ayatollahs”, suggesting the end is near for the Iranian regime. Giuliani's comments stand in contrast with the Trump administration's policy of not seeking a change of government even though it is reimposing sanctions that are crippling Iran's economy. Trump's National Security Adviser John Bolton told Reuters in August that "regime change" in Iran is not American policy. He said the administration wants a massive change in the regime's behavior. The State Department has said Giuliani does not speak for the administration on Iran, noted Reuters. In May, Trump withdrew from the 2015 nuclear deal between Iran and world powers. More recently, the President signed an executive order officially reinstating US sanctions against Iran. Trump has said he would be willing to meet Iranian President Hassan Rouhani without preconditions to discuss how to improve ties after he pulled the United States out of the 2015 deal. Iran was quick to dismiss the gesture, with an adviser to Rouhani saying that the only way back to talks with the United States was for Washington to return to the nuclear agreement.